The field proven ETI 7200 Series is ideally suited for military, industrial, medical and telecommunications applications requiring high reliability DC power. The rugged design is suitable for rack, vehicular or field deployable installations, yet is compact and light weight. If you need high-density, modular, N+1 hot swap power supplies, The ETI 7200 Series provides the ultimate in versatility with an MTBF in excess of 1 million hours and field-upgradeable configurations from 200 watts to 7.2 kW. The heavy-duty chassis, occupying only 5.25” (3U), has rounded metal corners and rugged handles, aiding in safe handling. Internally, all major components are well secured and electrically insulated to prevent damage due to shock and vibration. The EMI/RFI filters and input power factor correction minimize both input current and harmonics. The LED arrays keep the operator informed as to the unit's status. Overall, the ETI 7200 Series is uniquely qualified for critical shipboard, vehicle, airborne or land based systems combining advanced modular design features with highly reliable construction. At the heart of the ETI 7200 Series is a complete selection of standard off-the-shelf HDC modules with different combinations of input voltages, output voltages, currents and system interface signals. This allows you to tailor a power supply to your specific needs without the high costs associated with custom designs. Unlike typical custom power supply projects which take massive amounts of money, manpower and time, an ETI 7200 prototype can be configured and available in just a few short weeks. Our unique modular approach allows you to configure your power supply with up to 30 separate outputs in virtually any combination of voltages and currents. Extra wide trim ranges of +10 to -30% allow you to adjust standard outputs to any voltage between 0 to 72 VDC per LRU. If your requirement calls for dual redundancy, triple redundancy or more, we've got you covered. Our front-panel-control N+1 line replaceable units (LRUs) allow you to configure your power supply with the redundancy level and parallel operations you need. The ETI 7200 LRU is available with your choice of front-panel on/off Switch, Status Monitor LED, Test Points and/or Remote Voltage Adjustment. All outputs feature remote sensing capability. Wherever your project takes you, we have the input voltage you need. 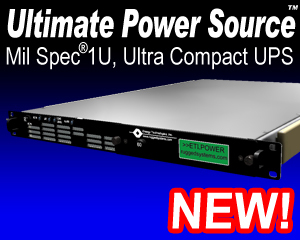 Universal power factor corrected AC front ends of 85-265 VAC (using 600 watt modules) allow you to configure a product capable of being utilized anywhere in the world. If you prefer, DC input voltages of 24, 28, 48 or 380 VDC are available with tolerance ranges allowing virtually any other voltage in between. The ETI 7200 is available in both 23" and 19" rack adaptor chassis. Both chassis feature rugged, industrial/military construction without sacrificing aesthetics. From the boardroom to the telecom room, the ETI 7200 is a welcome compliment to any environment. Your system's power and control needs are likely to change over time. Don't worry. We designed the ETI 7200 Series to be scaleable from 200 watts to as much as 7200 watts. Most upgrades can be predesigned or field implemented. 1) Modules can be configured to provide other voltages. Contact factory for details.